One of the best ways to explore Yosemite is through hiking. Be sure to include some of these day hikes on your next trip. The National Park Service (NPS) runs the Yosemite National Park and has hiking maps available for download on their website. 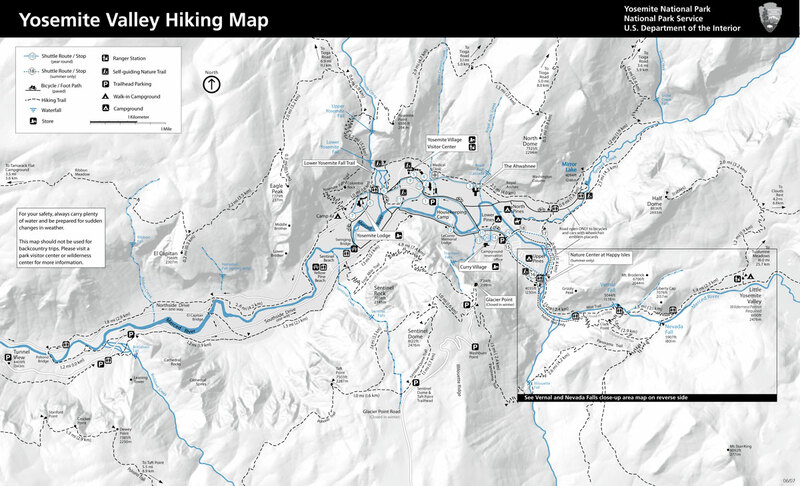 Once you decide which trail you are going to hike, print the map to use as a guide. Easy hikes are characterized by short distances or small elevations. All of these hiking trails are even wheelchair accessible and most allow dogs as long as they are on a leash. Bridalveil Fall is a paved hiking trail that takes you to the base of the waterfall. The one-half mile round trip should take the average hiker approximately 20 minutes to complete. The waterfall has water year round so you can expect a cool shower in the summer and slippery ice in the winter. Lower Yosemite Fall a partially paved hiking trail that takes you to an area where you can view both the upper and lower Yosemite falls during the 30 minute hike. The first half of the one mile loop is wheelchair accessible and pets are allowed. There is a slight incline and during the late summer months the falls may dry up. Cook's Meadow Loop is also a one mile loop that takes around 30 minutes to complete. The hike begins at the Valley visitor center and continues through a bike path and to Sentinel Bridge for views of Half Dome. Other views during the Cook's Meadow Loop hike include Glacier Point and Royal Arches. Mirror Lake is a two mile loop that begins at the Mirror Lake Trail head and takes about one hour to hike. Since Mirror lake does not have much water except in late spring and early summer, this hike is best reserved for those times. Mirror Lake (including the meadow) is a five mile version of the Mirror Lake hike. Instead of remaining on the paved path to Mirror Lake, hikers turn onto the marked meadow trail and continue around the lake in a loop that takes approximately two hours. Valley Floor Loop offers two options for hikers. The first, known as the half-loop, is a six and one-half mile hike that takes you over the Merced River via the El Capitan bridge. Once you have crossed the bridge, you can turn around to complete the half-loop or continue on for another six and one-half miles to complete the full 13 mile loop in approximately six hours. 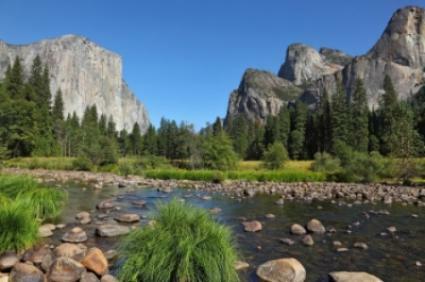 The full loop includes views of Cathedral Rocks, Three Brothers, Bridalveil Fall, and Yosemite Falls. Four Mile Trail is nine and one-half miles round trip and takes approximately six to eight hours to complete. While hiking, expect to encounter about 3200 feet in elevation gain. The trail begins at the Four Mile Trail head and culminates at Glacier Point. For a less adventurous hike, consider buying a bus ticket that takes you directly to Glacier Point then hike down. Panorama Trail is an eight and one-half mile round trip hike to the Valley floor. This is a difficult hike due to the steep elevation gains and often snowy conditions. For an experienced hiker, this hike is definitely worth the effort because, as you would expect from the name, there are some wonderful panoramic views of the entire valley. Nevada Fall is only five and one-half miles round trip but due to icy conditions from the mist, this trail is closed in the winter. The elevation gain is about 2000 feet and the trip should take around six hours to complete. The trail begins at Happy Isles and ends a the top of Nevada Falls. Though you are only planning a day hike, make sure you take the proper supplies to reduce the chance of illness or injury. The trails intended for day hikes in Yosemite may not be well traveled during certain times of the year, so you should always be prepared for emergencies by bringing a first aid kit. Sufficient water and food such as energy bars are also needed. By taking a few precautions, your trip to one of the most beautiful parks in the world will be a success.